Mike van Biezen – adjunct professor at Compton College, Santa Monica College, El Camino College, and Loyola Marymount University teaching Physics, Mathematics, Astronomy, and Earth Science – is about to be branded as a science traitor, blacklisted, ridiculed and possibly demoted by the Global Warming Inquisition of Socialist-Possessed Climate Alarmists. If you are the type of person that despises to be lied to, you better read the whole article. Study it. Take notes. … directly contradictory to what would be expected if global warming were real. … until 1998, the global average temperature remained unchanged in direct contradiction to the earth-bound weather station data, which indicated “unprecedented” temperature increases. … It is obvious why the global warming community does this, and very misleading (or deceiving). … Many places around the world experienced a quite significant and persistent cooling trend to the point where scientists began to wonder if the world was beginning to slide into a new ice age period. … There must be stronger factors driving climate and temperature than atmospheric CO2. I’m just guessing here, but is this A Stronger Factor? … Since land area of cities and large towns containing these weather stations only make up a very small fraction of the total land area, this influence on global average temperature data is significant. Not to mention the fact that many (if not most) of these weather stations have been tampered with and/or malfunctioning. … Contrary to what would be assumed when listening to global warming banter or while watching An Inconvenient Truth, higher temperatures increase atmospheric CO2 levels and lower temperatures decrease atmospheric CO2 levels, not the other way around. … What we can conclude is that the ice ages were not caused by changes in the atmospheric CO2 levels and that other stronger factors were involved with these very large climate changes. … 1990 IPCC report a chart appeared that showed the medieval warm period as having had warmer temperatures than those currently being experienced. But it is hard to convince people about global warming with that information, so five years later a new graph was presented, now known as the famous hockey stick graph, which did away with the medieval warm period. When you read the article you saw – in the 10th section, “Data adjustment” – several charts where the author showed actual data versus the Global Warming crowd’s data. I took a few of them and overlayed the real data on the warming lie data to produce some charts that more accurately represent the magnitude of the lie. 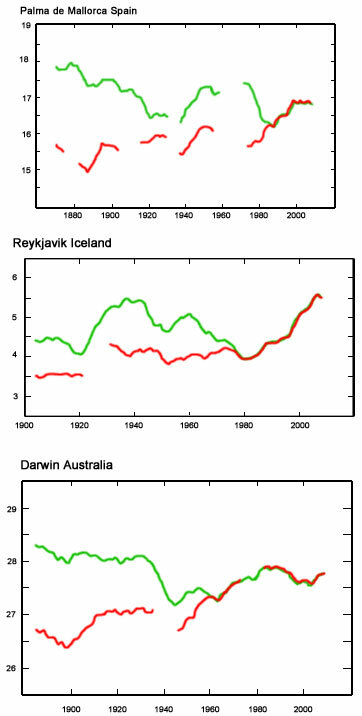 Actual data is green, the Global Warming Hoax “adjusted” data is in red. I think this shows what they were doing, don’t you? Number 10 may be the most compelling because it underscores that anthropogenic global warming is not just an error or a hysterical fantasy, but a systematically orchestrated lie. Unfortunately, many believe in the hoax out of sheer ideological obedience, and are immune to fact-based arguments. December 31st, 2015 under MMCC.